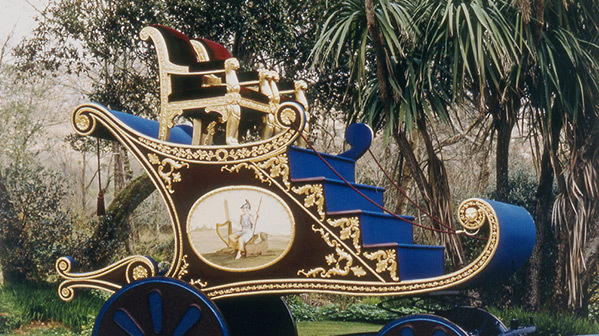 In September 1844, this extravagantly ornate ‘chariot’ was drawn through the streets of Dublin by six splendid grey horses, accompanied by a crowd of around 200,000 citizens. Sitting on the gilded seat was the most celebrated, adored, feared and despised Irishman of his time: Daniel O’Connell. He was being taken from Richmond Bridewell, on the site of what became Griffith barracks in Dublin, to his home on Merrion Square. O’Connell, his son John and others were found guilty on conspiracy charges after a 24-day trial that opened on 15 January 1844. They were sentenced to twelve months in prison, fined £2,000 and bonded to keep the peace for seven years. On 4 September, however, the House of Lords overturned the verdict. The ‘chariot’, 3 metres high and 4.5 metres long, was specially made for O’Connell’s glorious re-entry into the city, and modelled on the triumphal cars of ancient Rome. It was upholstered in purple silk and blue wool and adorned with gilded mouldings and decorative overlays, depicting shamrocks and stylised classical foliage. The sides showed Hibernia with the increasingly familiar national iconography of harp, round tower and wolfhound. On the back was a representation in gold of a harp surmounted by the word ‘Repeal’, summarising O’Connell’s campaign for repeal of the Act of Union. what we find nowhere else is the continued empire of a single man, who during 20 years has reigned over his country without any title, save popular assent, every day required and every day given… his power is only maintained on the condition of incessant action; hence that feverish agitation by which he is distinguished. O’Connell’s agitation encompassed the rights of Jews and American slaves, but focused primarily on repeal. His campaign failed; but it put Ireland at the centre of British politics and created a politicised population whose skills would help shape politics, not only in Ireland, but in Britain and the US.